Thank you for your great response to Monday's post discussing our homeschooling journey. In today's video I show you our homeschool room. It is pieced together with older furniture, plus storage and desk solutions from Ikea. We love our room and enjoy learning in it each weekday. I often find the kids hanging out in this room on the weekends as well, dong crafts and reading. This video isn't just for homeschoolers, but for anyone looking for storage inspiration and work space/ craft room ideas for your own children. I hope you enjoy the tour in today's video. 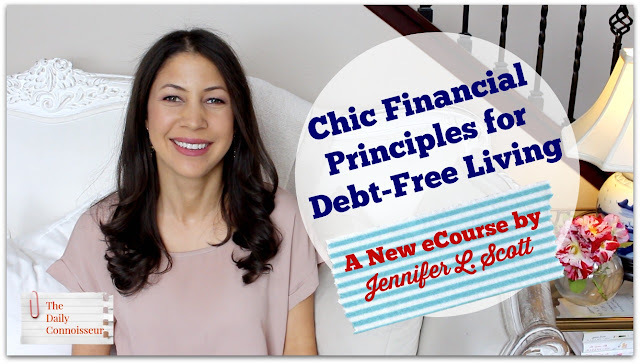 My new eCourse, Chic Financial Principles for Debt-Free Living, is a class that will inspire you to change your shopping habits, your spending habits and to live richly beneath your means. Here is what Gillian had to say about the course, "I've just finished your course and I'd just like to thank you for your wise advice and let you know how much I appreciate and value your hard work which is delivered in such a beautiful way. I've enjoyed reading all of your books and refer to them again and again. I love the whole concept of the 10 item wardrobe, enjoying my home life and living frugally but well. To me this is the essence of a life well lived when every aspect is in balance and relished as a "daily connoisseur". Thank you thank you thank you. With love and blessings." Thank you so much, Gillian. I am so happy you enjoyed the course! Sarah E. writes, "Hats off to you, Jennifer. My mother was a saint and took on the very labor-intensive task of homeschooling me and my four sisters from kindergarten through 12th grade through Abeka Academy. I am deeply indebted to my parents for doing so. Though there were several naysayers who worried about our lack of socialization, I found it liberating learning without the daily distractions my friends were experiencing. This and my parents were staunch believers in community involvement, so my sisters and I experienced no shortage of play, peers, or necessary social friction. In the end, I loved learning at my pace and was able to graduate early before pursuing my bachelors and masters degree at my university. While I agree it is not for everyone, you are clearly on the right path. Best of luck to you!" Thank you, Sarah! My favorite part about reading everyone's comments on Monday's video was hearing all of the success stories. Thank you for sharing your homeschooling experience with us! I would love to know what tips and ideas you have for organizing your children's work space, whether you homeschool or not. Playroom organization ideas are welcome too! Let us know in the comment section below and your comment could be chosen as comment of the week on the blog. Hi Jennifer! Happy New Year! I’d love to see a video about your journey of home schooling so far. I know you’ve touched on it, but I’d like to know more detail. Do you feel like the minimum requirement is enough or are you very thorough? Was the transition from having the girls at school to home bumpy? Do you find that each child needs to be taught differently? Do you sit down with them x number of hours a day, or are they to some extent self taught? I was homeschooled from K-12th grade, but I like to hear other’s experiences as being the homeschooled student is very different than the teacher/parent! I have a 2yr old and 10 month yr old, so quite awhile to think about it. In the meantime, I’d love your advice! Hi Hadasah, I believe I answer almost all of your questions in today's video, plus a lot more. Why do we homeschool? How do we homeschool? What curriculum do we use? How long does it take us? What about socialization? Are we taking the standardized test? Do we plan to do it next year? All of these questions, plus much more are answered in today's video. As a disclaimer that I mention in the video, today's discussion is in no way a criticism of public or private school. Every parent makes the best choice for their family and homeschooling isn't necessarily right for everyone. As for curriculum, my Kindergartener uses Abeka almost exclusively and we also supplement with this awesome reading book called, Phonics Pathways. My 2nd grader uses Horizons math, Christian Light Education for language arts and reading and Abeka for history and science. We are very happy with our curriculum choices for this year. I'm noticing that my daughters are retaining their knowledge and enjoying the learning process, which is a huge plus. I truly hope you enjoy today's video. ** Please note: in the video I mention I went to public school for my entire education. I meant to say my entire undergrad education. My newest eCourse, Chic Financial Principles for Debt-free Living is getting rave reviews! You cannot imagine what a difference you are making in my life (I'm nearing 80 years old) and the lives of my awesome granddaughters!!! 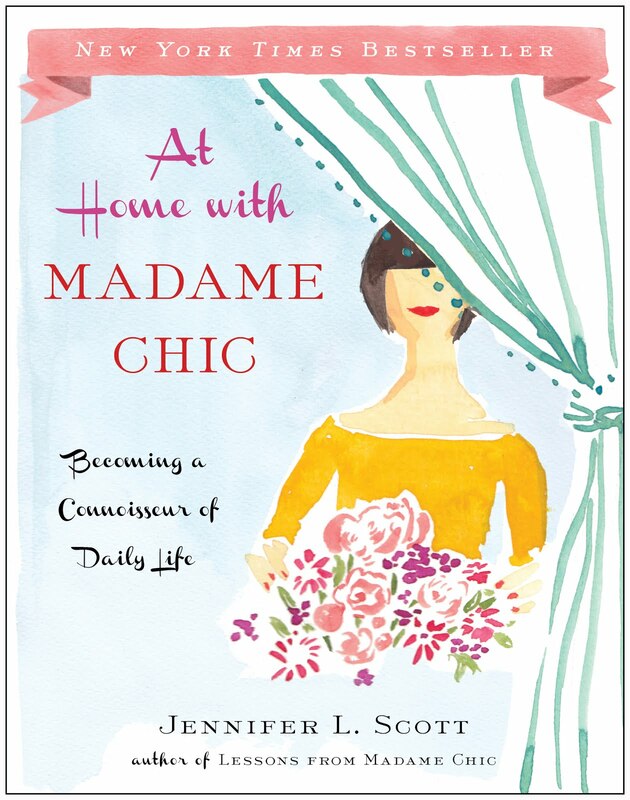 I stumbled upon your Madame Chic book several years ago and shared it with a granddaughter who was really struggling finding a direction for her life at the time. Very long story short, at 16 she got her hustle on, completed high school early, spent a study semester in France before entering college. She is now enrolled at a major four-year university studying film with with minors in French and Spanish. She also has younger sisters who are also really into your books as I have bought them all. Love this course and am making sure they also take it. So, from the absolute bottom of my heart I extend my deepest and most heartfelt "Thank you! dear Jennifer for all your hard work." Linda, I am so excited to hear that the Madame Chic books and my eCourses are benefiting multiple generations in your family! Wonderful! My children eat baked oatmeal topped with nut butter, my great-grandmother's buckwheat pancake recipe (delicious), or whole-grain waffles that I make. Sometimes I will also make a breakfast casserole for them...we have chickens, so there are always fresh, healthy eggs on hand. And my husband eats oatmeal with nut butter & almond milk & fruit every morning, except after his long run on Saturday, when I make him buckwheat pancakes. Starting the day with a beautiful breakfast is kind of a quotidian luxury that I enjoy. So do you, I see!" Polly, I have only one thing to say in response to your comment... YUM! 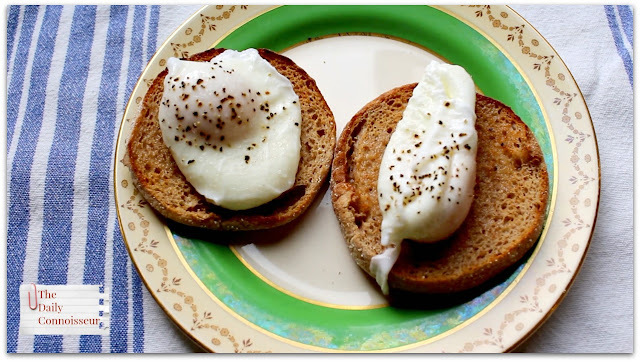 :) Thank you for sharing your family's favorite breakfasts. Today, I would love to hear from you. What are your thoughts on homeschooling? Were you homeschooled? What is your child's experience in school, whether it be public, private or homeschool? If you homeschool, what is your favorite curriculum? Please be respectful in the comment section. I appreciate that everyone who watches this video might differ strongly in opinion. Your kindly-worded response is always welcome. I'll see you on Thursday for the homeschool room tour! I'm sharing a typical week of breakfasts in our home. 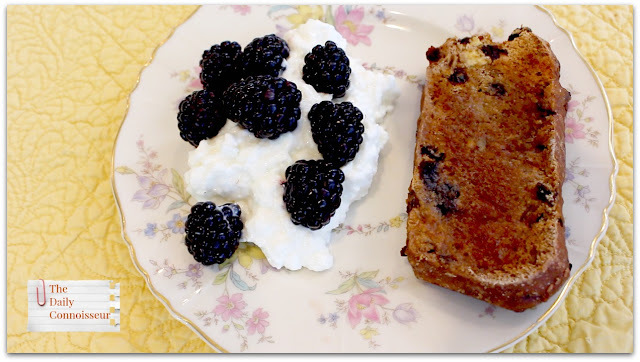 I like to eat a variety of breakfast foods: fruit, eggs, breads, oatmeal and yogurt/ cottage cheese. This video shows a sample of what I might eat in one week. As the seasons change, so do my breakfasts... These really represent late winter/ early spring. 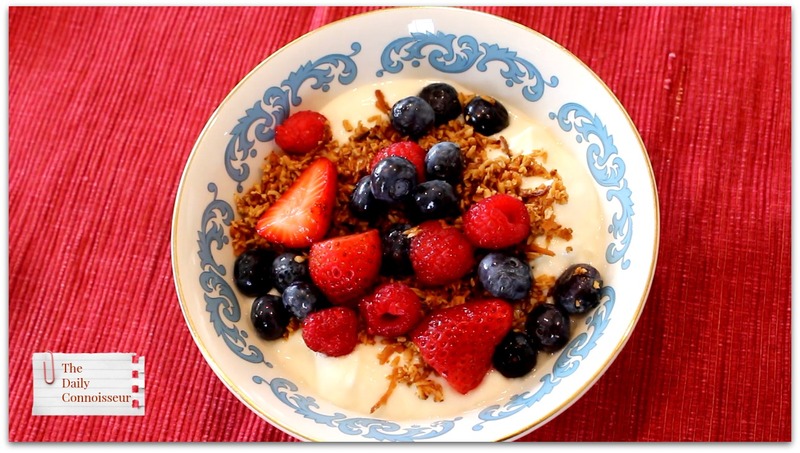 Homemade yogurt and coconut granola with mixed berries. I use the EuroCuisine yogurt maker to make my yogurt. I will do a video on this in the future. Also, the granola recipe I truly love is from How Jen Does It. 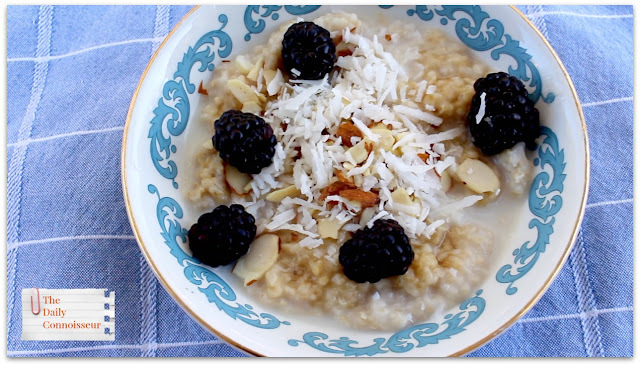 Coconut almond chia seed oatmeal with blackberries. You can see the recipe for this here. 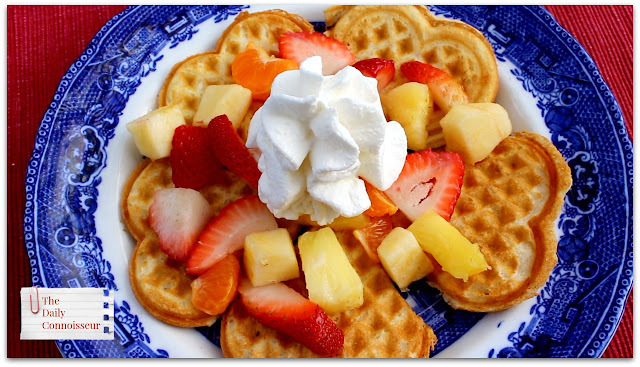 Homemade heart-shaped waffles with mixed fruit and whipped cream. A perfect weekend treat! Check out my affordable eCourses: Chic Financial Principles for Debt-Free Living and The Ten-Item Wardrobe. Sivuonthuon L writes, "I loved this course Jennifer. It was affordable and an inspiration to push me to try to live debt free as well. Thank you!" Thank you for all of your great comments on Monday's Rebounder Routine video. I was nervous to put the video up because exercising in front of other people is not my favorite thing to do :) But your supportive comments were very encouraging! Christina M writes, "I loved this video. Thanks for sharing. I've never heard of rebounding, but I'm going to look into it. My kids would LOVE it. And . . . your backyard is gorgeous.﻿"
Thank you, Christina! I'm happy you enjoyed the video and am excited for you to try rebounding. I would love to know... what do you regularly eat for breakfast? 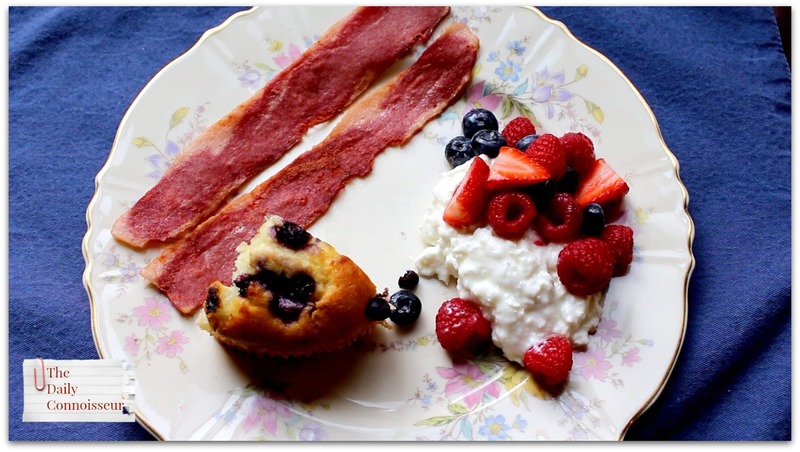 Which breakfasts featured today do you like the best? As requested, today I am sharing my rebounding routine with you. If you read my previous fitness update post, you know how much I love using the rebounder. Not only do I love it, but my entire family loves it... even the baby! The girls will often hop on the rebounder several times a day, giving them great exercise. I like to jump on the rebounder for a minimum of 5 minutes every day, but usually I jump longer than that. Today, I'm showing you some of the different routines I do on the rebounder. For the sake of time, I only show a few repetitions per move, but you can extend each of these moves to create a longer jumping routine. As a disclaimer, I am not a professional, nor am I a physical trainer. This is just one of the routines that I use. If you have health issues, always consult your doctor before beginning a new fitness routine. We use the Needak Rebounder because of its excellent quality. I also love that Needak is a family company and all of their rebounders are made in the USA. The spring lubricant mentioned in the video is included in the rebounding kit, along with instructional DVDs and articles. If you need to purchase the spring lubricant separately, you can find it here. To read about the abundant health benefits from the rebounder, check out my previous fitness routine article. Here's another great testimonial for my new eCourse, Chic Financial Principles for Debt-Free Living. DJ writes, "Hi Jennifer, I finished your debt-free eCourse last night. It was great. I just want to encourage everyone who reads your blog to take this eCourse. There is something for everyone. You put a lot of thought and work into each class and it really shows. As a side note - wow, you live in a beautiful area! I had to watch, the benefits of a debt free life, twice because the first time I was so distracted by the lovely background!!! To all Jennifer's readers - take the class - it's really good!!!" Thank you so much, DJ! I loved your testimonial and am happy you had such a positive experience taking the course. Karen writes, "My favorite mask comes from my kitchen- raw honey, cinnamon and nutmeg." Hi Karen, thank you for sharing your homemade mask recipe with us. I will have to give this a try! I hope you enjoyed today's video. I would love to know what you like to do on your rebounder. Let me know and your comment could be chosen as comment of the week on the blog. 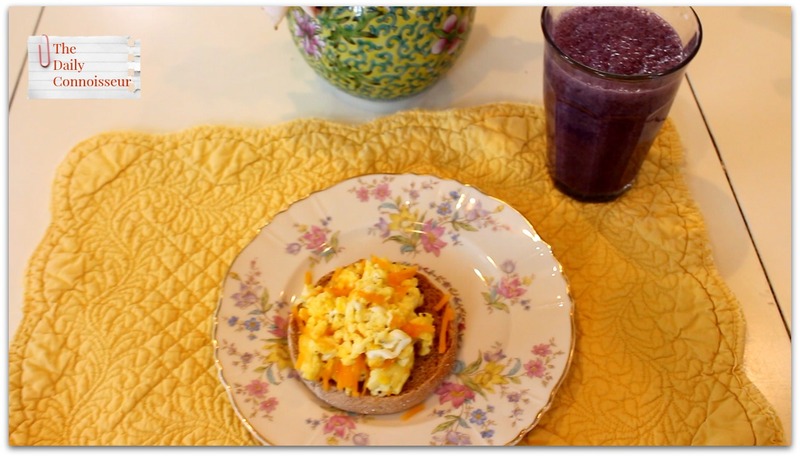 See on Thursday as I share one week of breakfasts. Skincare week continues on The Daily Connoisseur as I try out a new mask today. I love applying a mask once a week as part of a regular skincare routine. In the past I have always used Epicuren's Volcanic Clay mask, but after using this mask for several years, I was looking for something new to try. I knew I wanted to keep it natural so I was excited to try Honey Belle's DIY Detox Mask in charcoal and cardamom. This is such an innovative mask. You take one tsp of the powder mask mixture and mix it with 1 tsp of liquid. You can use whatever you like: water, apple cider vinegar and even milk. My new eCourse, Chic Financial Principles for Debt-Free Living, will inspire you to change your shopping and spending habits and encourage you to live richly beneath your means. Here is what Imdur had to say, "I have listened to all of it! Amazing, Jennifer! It was so useful and helpful and I will start on that budget ASAP, and start including rice and beans regularly:) My family loves rice and beans anyways." Hi Imdur, I joke often throughout the course about rice and beans, but truly the message is to be frugal-minded in all we do, including what with what we eat. That will be different for everyone. I am so happy you enjoyed the course! I found this older picture from one of my first book signings. A reader waiting to get her copy of Lessons from Madame Chic signed. Wonderful! Regarding my pronunciation of the exotic ingredients in Monday's skincare review, Nadine writes, "Very good first time pronunciation of Maori. Harakeke is New Zealand flax and Pohutakawa is known as the New Zealand Christmas tree, kawakawa is used in traditional medicine." Hi Nadine, thank you for letting us know what these are. I have always wanted to visit New Zealand. I'm sure the land is full of amazing healing plants. Wonderful! I hope you enjoyed skincare week on The Daily Connoisseur! Today, I would love to know... do you use a mask as part of your skincare routine? Which one is your favorite? FTC: This is not a sponsored post. Honey Belle sent me their mask to review. All opinions are my own. This post contains affiliate links. **Update** Please note that Nudu has changed their name to Pellu. Their updated discount code is JENN20, which will give you 20% off any item of your choice. It's skincare week on The Daily Connoisseur! I have had many requests to review a natural skincare line. I'm excited to share my in-depth review of Pellu Natural Beauty today. 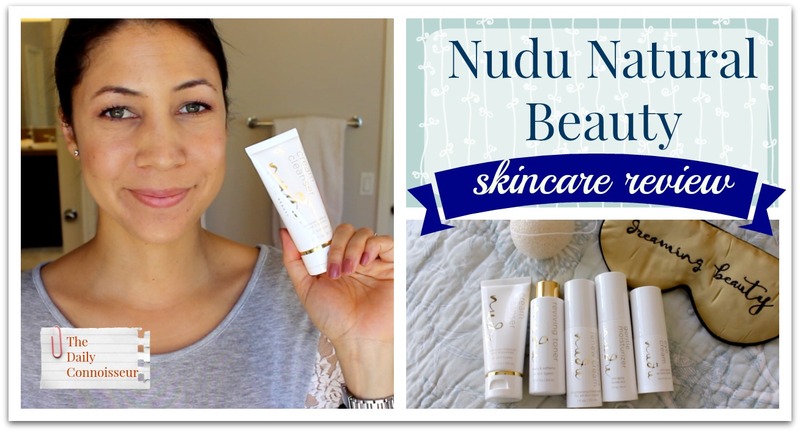 Here are some of the many benefits of the Nudu skincare products. Premium botanical actives with proven skin benefits. Antioxidants for powerful anti-aging defense and repair. Pure, nourishing plant oils to reduce water loss. Calming ingredients to sooth red and irritated skin. Skin-friendly compounds for tone, softness and elasticity. Working together these ingredients help to combat visible signs of aging. They protect against pollution and the cellular damage caused by free radicals. You'll love the silky textures and subtle natural scents of your Nudu beauty ritual. Today's video shares my first impression of the skincare and comes back over a month later for an update. I personally think this is a fantastic skincare line. My skin has become clearer and more radiant since I started using Pellu. I love the toner especially. It always picks up extra dirt and makeup even after using the makeup wipe and cleansing. I can happily recommend this to anyone looking for a high quality natural skincare line. Thank you, Pellu! My new eCourse, Chic Financial Principles for Debt-Free Living, is receiving rave reviews! Thank you to all who have taken the course and commented. Here is a testimonial from Vinusha, who writes, "I am so happy, and I feel so blessed that I was able to take this course. I am more motivated and inspired to save and pay off the student loan. This course also helps me to prepare for the future. Thank you for this beautiful course, and thank you for making our lives brighter! Vinusha, I am excited for you! Thank you for sharing your testimonial with us. Noel writes, "I saw your TED talk and I thought your concept was incredible. I have always looked for ways to live a very minimalist lifestyle. This is an amazing fix to a real problem. Too much laundry, taking too much time to choose what to wear, hanging on to clothes I don't wear. Thank you." Thank you, Noel. I'm happy that my TEDx talk sparked interest for you in the ten-item wardrobe. I know you will enjoy the process and the freedom involved with creating your own! I hope you enjoyed today's skincare review. See you on Thursday as skincare week continues. I will try on a new mask and share a funny story with you! See you then. FTC: This post is not sponsored by Nudu. All opinions are my own. This post contains affiliate links. Today I'm interviewing the fabulous Teri Reynolds on her new book,Marie Antoinette and the Hidden Door of Versailles. 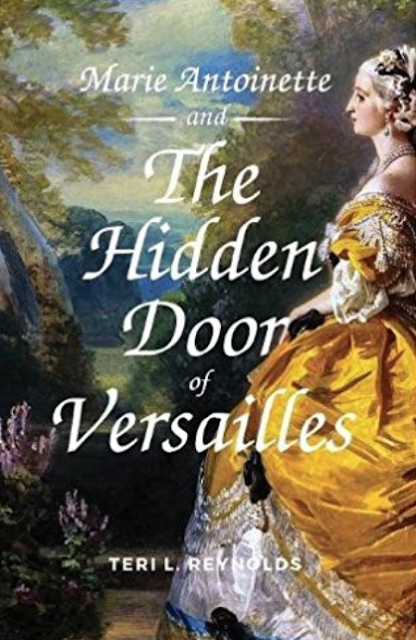 Follow Marie Antoinette on an unexpected journey where she must choose between love and duty. Place: The Palace of Versailles Date: November 1773 A young Marie Antoinette has left her home in Austria and fulfilled her duty to marry Louis XVI. Late one night she steps through a hidden door and enters a world she does not know or understand. She must find courage and resourcefulness in order to survive. On her journey she encounters 2 strangers: a young man who seems honest and trustworthy, and an older, sinister man who looks at her with knowing eyes. When she inadvertently finds out her future fate, the stakes grow high. Her very life hangs in the balance. Marie's sense of duty and loyalty demands that she find a way back to her former life, but she is torn. She has a choice to make. The door stands open... but time will not stand still. Teri has a wonderful YouTube channel called, TeriGigi. I had the opportunity to read Teri's rough draft for this debut novel and I found it unexpected, fun and intriguing. Well done, Teri! Mentioned in the video: Teri's Review of Polish Your Poise with Madame Chic and Teri's review of At Home with Madame Chic. I hope you enjoy today's interview with Teri. We discuss writing, Marie Antoinette, what it's like to be YouTuber and so much more. Nikki writes, "Hello Jennifer, I needed this. Honestly, I just bought the course because I want to support you I just realized that it actually helped me. A lot. Thank you so much." Rhina F writes, "Jennifer, thank you very much for this wonderful course and for making it so affordable for everyone. I love the ideas and tips you shared. Regards from Spain!" Sarah writes, "What a wonderful course - thank you for making it so affordable. It’s given me a lot to think about and has inspired me to continue to make positive changes in my debt free journey." 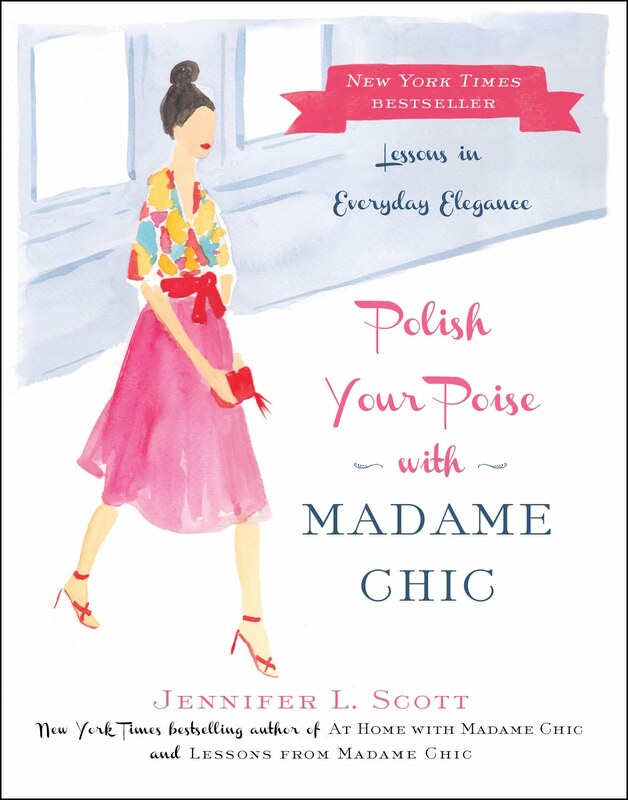 Don't you just love this picture featuring Lessons from Madame Chic? I am 61 and just found you last week! I reserved all three of your books from my local library and read them all in one week. 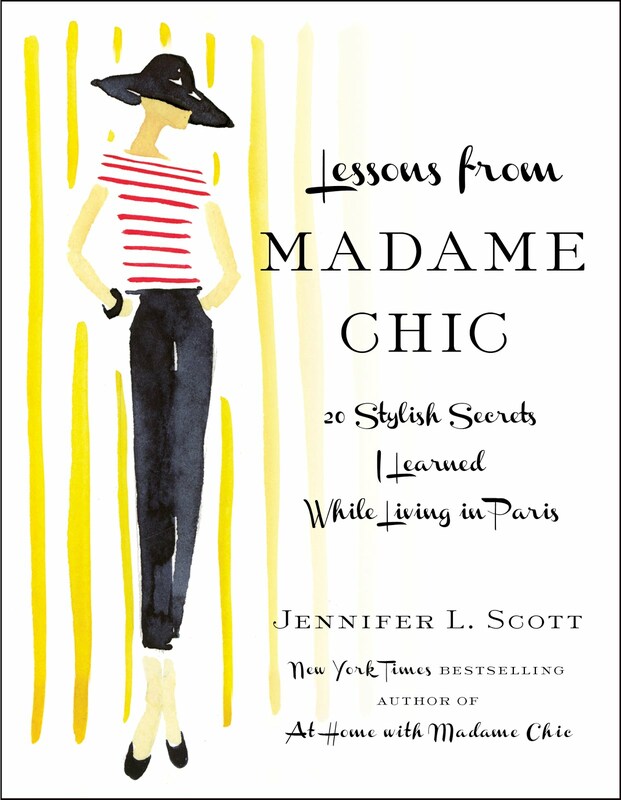 Then I purchased your Lessons From Madame Chic in hardcover for me to keep and reread! You have rocked my world, you darling girl. You have me thinking about my presentation in a way that I never have before. I realize now that my mother completely embodied the grace and poise and chic that you describe. As for me, I settled for yoga pants and worn out jeans. I am now curating my wardrobe like never before and giving it a big upgrade and am so excited about the changes. I only wish I had found this advice as a young woman. I cringe when I see some of my young life photos! You were lucky to have gained this knowledge and insight at such a young age. I am so grateful to you Jennifer …better late than never! I look forward to a chic last act for myself and to visiting you often on the Daily Connoisseur!" Gail, thank you so much for visiting my guestbook and leaving me this great comment. I am so excited for you and the changes in your life. It sounds like your mother was an amazing woman. Thank you for your support! 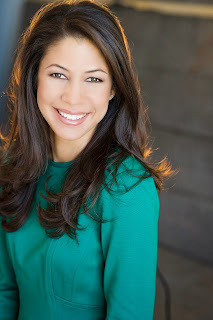 Today I would love to know your thoughts on my interview with Teri. Your comment could be chosen as comment of the week on the blog! See you on Monday for skincare week on The Daily Connoisseur. I'm back from my break! The past two weeks I was able to make great headway on my book, do our taxes and just relax a bit. I even found time to play the piano. Thank you to everyone who has taken the debt-free eCourse. I've had so much fun connecting with you over there. It's been truly an amazing experience. So now I am back and I have many great things planned for the blog this month. Starting off with today's fun video. The Daily Connoisseur is never short of clips to add to a bloopers video! You get to see Mr. Connoisseur losing it a bit, Jamie Cat Callan's generous offer, my stuttering, and how animated my children are while I'm cooking (now you know why I always have to do voice-overs for my cooking videos). I hope you enjoy today's video and that it brings you a good laugh! My new eCourse, Chic Financial Principles for Debt-Free Living, will inspire you to change your shopping and spending habits and to live richly beneath your means. Here is what Katrina had to say about the course, "I'm loving the course!! Thank you so much for telling your story and giving us a glimpse into how it all worked for your family. I'm amazed what early and late hours you keep to get the business done each day! Wowzers!" Gi K writes, "I have just enrolled; not only for the amazing content but also to touch base with you on a daily basis once you are taking a break.😍﻿"
Thank you, Gi. I had a great break. It was nice to recharge my battery. I appreciate your support and hope you enjoyed the course! I hope you enjoyed today's bloopers video. I'll see you Thursday for a fun interview with author, Teri Reynolds.